NC State recognized more than 30 faculty for their dedication to teaching, mentoring and innovation at the 2017-2018 University Teaching Awards Ceremony on April 4. 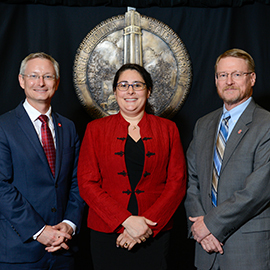 Melissa Pasquinelli (center), NC State’s 2018 University of North Carolina Board of Governors Award for Excellence in Teaching winner, with David Hinks, Dean of the College of Textiles, and Duane Larick, Senior Vice Provost for Academic Strategy and Resource Management and Provost’s Office Chief of Staff. Melissa A. Pasquinelli received the University of North Carolina Board of Governors Award for Excellence in Teaching, the most prestigious award given to faculty for teaching excellence. The award process is coordinated by the Office of the Executive Vice Chancellor and Provost and the Office of Faculty Development. In 1993, the UNC Board of Governors established the award to underscore the importance of teaching and to encourage, identify, recognize, reward and support good teaching within the UNC university system. Each college may nominate one candidate for this award, with one candidate selected as the overall winner. Pasquinelli is a professor and associate head in the Department of Textile Engineering, Chemistry and Science (TECS) in the College of Textiles. She is also the director of graduate programs for TECS, the director of the Laboratory of Multiscale Modeling from the Nanoscale in the College of Textiles and the associate director of the Analytical Instrumentation Facility in the College of Engineering. She teaches a variety of undergraduate and graduate courses such as computer modeling and engineering thermodynamics, while continuously seeking new ways to challenge and engage her students. Pasquinelli also mentors students ranging from high school to the postdoctoral level, often including these promising scientists and engineers on her research team. Since 2010, Pasquinelli has been a member of NC State’s Academy of Outstanding Teachers. In 2014, she was named a University Faculty Scholar and Alumni Distinguished Undergraduate Professor. In 2016, she received the Peer Faculty Mentoring Award from the College of Engineering. At NC State commencement on May 12, Pasquinelli will be presented with a medallion and a cash prize by a member of the Board of Governors. The Memorial Belltower will be lit red in her honor at a time of her choosing. 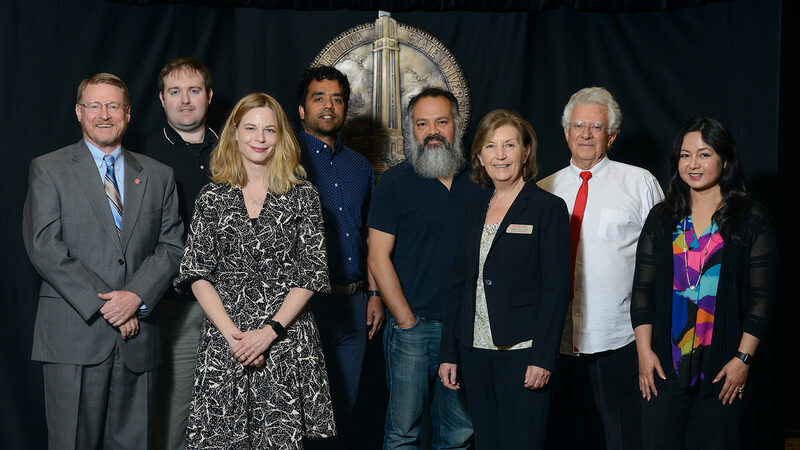 The award, first given in 2002, honors the creative pedagogy of NC State’s faculty and technical staff and their work in integrating new technologies into effective teaching strategies. Gertrude Cox, “The First Lady of Statistics” and the award’s namesake, came to NC State in 1940 to establish the university’s distinguished Department of Statistics. The award, coordinated by the Provost’s Office and the Office of Faculty Development and sponsored by the NC State Alumni Association, is one of the most prestigious undergraduate awards given on campus. Up to six recipients will receive this recognition each year and retain their title for the duration of their career as an NC State faculty member. A cash award will be presented to each recipient at the Alumni Faculty Awards Reception on April 23, and award recipients will be honored at commencement.